The SAP HANA Cloud is a business solution that has helped transform thousands of organisations worldwide. Commonly associated with improving efficiency and productivity for manufacturing and finance, the HANA Cloud has also a more active side. 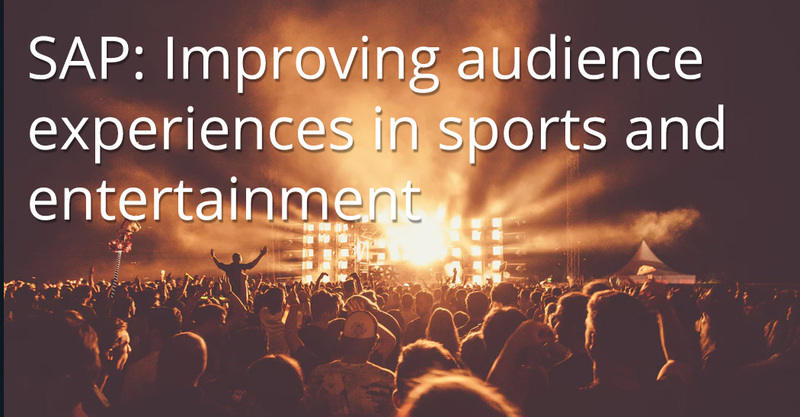 The sports and entertainment industry has taken advantage of this technology and has worked in partnership with SAP to launch applications that create better experiences for their customers, from client reviews, to statistics and performance-monitoring apps. The Canadian worldwide entertainment company Cirque du Soleil has added SAP technology to “TORUK”, one of their live shows inspired by James Cameron’s film Avatar. SAP created an audience engagement application that links the audience’s phones with creative elements of the show. While most acts require spectators to turn off their phones when the show is about to start, Cirque du Soleil requests its audience to turn them on and to download the app, encouraging them to participate. The real-time interaction has been made possible by using the SAP HANA Cloud, which detects groups of users in the audience, and sends signals to the show’s visual effects control system. The German Football club uses SAP Process Orchestration to collect data from various systems in and around the arena. The information is displayed to event managers and staff via mobile apps allowing them to access real-time information via the SAP HANA Cloud. With the use of this software, the club can monitor the flow of spectators at the stadium’s entrance and till points and control the fans intake to avoid crowds. It also monitors the traffic and parking spaces availability, allowing the club to control the cars’ speed with the aim of avoiding traffic jams on game days. The goal: to provide a better overall customer experience. Parkwood Entertainment, a company from New York City that specialises in event management, uses a customized social listening and fan tracker software created by Phizzle, a partner of SAP. The app looks for keywords in Twitter conversations and identifies who the fans and super-fans are. It analyses what the community is talking about, buzzwords, expectations and preferences such as where they eat or shop. This allows Parkwood to understand fans better and to create tailored experiences by adding elements to the event that fans identify with. The recorded data is also utilised by Parkwood to create advertising and e-mail marketing, ensuring their customers get the right offers and information at the right time and through the correct channels. CHIO Aachen is a world equestrian festival in Aachen, Germany. The festival has introduced the use of a fun app called SAP Spectator Judging that runs on smartphones and tablets to provide fans with a better experience by getting them involved during the festival. The app works using innovative tracking technology, allowing fans to follow the cross country run through the whole ride, showing the location and performance of the horses and riders. Spectators can also actively participate by co-scoring the competitors in real time and by taking part in equestrian quizzes. The app is part of SAP Equestrian Analytics which provides a new tracking and visualisation technology that allows riders and coaches to analyse the speed, heartrate, routes and performance during each run to define strategies and training plans to help them improve for future competitions. The National Basketball Association launched an SAP app with the goal of growing their business by increasing their fans engagement. The app allows fans to see back-dated and real-time statistics from all NBA teams and players directly on the NBA’s official website, helping fans in their efforts to predict results and analyse games. These changes have helped the business grow their online presence to over a billion users. They also use the SAP HANA Cloud to manage budgets and make business projections. Improving the fans’ experience as a strategy to gain and retain customers is becoming more popular as technology and social media evolve. As SAP services become more versatile, so do their clients. Casinos, museums and many other verticals in the entertainment industry are also now adopting the HANA Cloud to improve their operations, and sport organisations are using technology to improve their athlete’s performance and game strategies. Stay tuned, because we will hear more about that very soon.